There are tons of great restaurants in the area. This list does not do the area justice, but does include some of our favorites over the years. 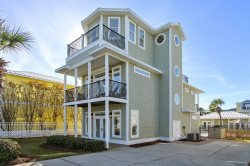 The shopping scene continues to grow each year, in, and around Destin. Here is a guide to some of the larger venues, but there our countless cute boutiques here, so plan some time to go out exploring! Unless you move and are here for 10+ years, you can`t run out of things to do in our little slice of paradise! Here are just a few of the fun excursions and diversions available. Destin is blessed to have some of the finest and most beautiful golf courses around. Destin - The Luckiest Fishing Village in the World! Our son, Ryan, with his big haul awhile back!